Hammer Time! | Comics I Don't Understand - This site is now being updated daily at http://www.comicsidontunderstand.com. Please change your bookmark if necessary, and notify any web site with a link to the old address. Because, with the actual day of Christmas comes an end to the relentless hammering of Christmas commercialism. It may not be 100% over, but the end of 24/7 carols and lights and stuff is in sight. I think this is a comment about how every year we put ourselves through the craziness that Christmas has become, which Arlo is comparing to hitting oneself on the head with a hammer. 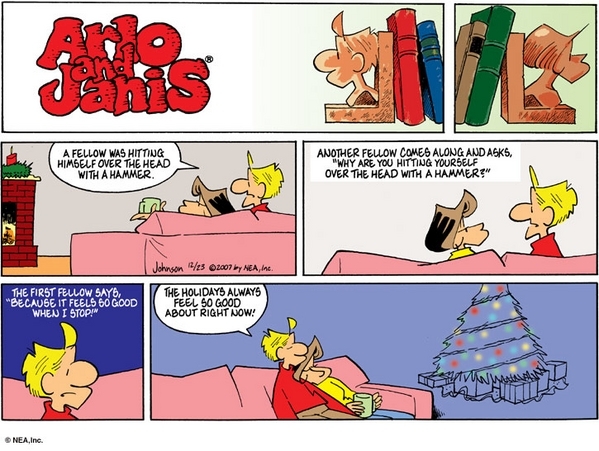 I can’t tell from the last panel of this is actually after Christmas or not, but it is clear the he and Janis have ‘stopped the madness’ at least for the moment, and it feels very good. I think, temporally, this comic is located at the point at which all Christmas preparation is finished, and as much as the rush of present shopping and tree decorating etc can be stressful. It feels so good when you’re done and you know that Christmas is going to go ok.
A&J is the best. Look how Johnson depicts coziness so simply. Have you seen the wikipedia entry? He does show the coziness very well. And I have to say, it’s probably one of the best feelings in the world. One reminder – Christmas is only crazy when you let it be. Simplify! “Simplify” is a recurring theme for Johnson.